NID Admit Card 2019: National Institute of Design (NID) will shortly issue the NID DAT admit card on its official website for the preliminary exam. 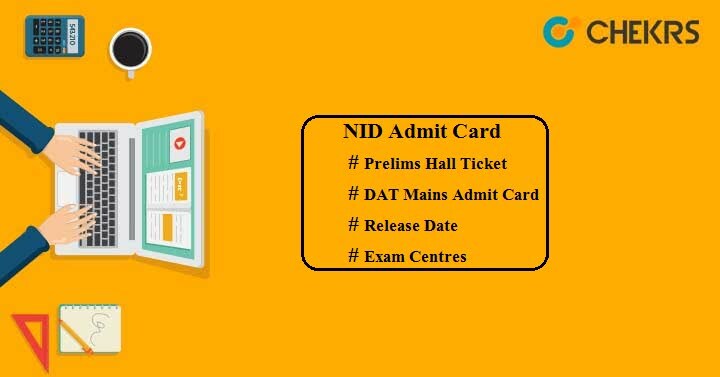 Latest Update: NID 2019 Admit Card has been Released today at 16:00 on the Official website!! Check the procedure to Download Yours Here. Candidates who have successfully submitted their applications before the last date will be able to download the NID admit card through online mode. NID authority will not be responsible for sending the admit card to your postal address. Read this article completely to know more information related to NID B Des Admit Card and GDPD admit card also. By following the procedural steps mentioned below, you will be able to download your NID DAT Prelims Admit Card. Click on ‘LOGIN TO DOWNLOAD ADMIT CARD’ link. A new page will be opened on your screen. Enter the asked details such mail address, password etc. and submit it. You will see your DAT Prelims 2019 Admit Card on your screen in PDF format. Take a print-out of the downloaded admit card. Here we have provided the list of examination centres. Check the list and select your nearest test centres as per your preferences. It is compulsory to carry your hall ticket to the examination center during the examination. Otherwise you will not be allowed to enter the examination center. Candidates are suggested to verify the details printed on the admit card. In case of any discrepancies, must report to the exam conducting authorities regarding the same. Must bring any of the government Identity Proof such as Voter ID, Aadhaar Card, PAN Card, Passport or Driving License etc. Candidates must retain the NID Hall Ticket secure for future use. Report to the examination centre 1 hour before commencement of the examination. Do not write anything on the admit card. Otherwise you will be expelled from the exam. Read all the instructions given on the hall ticket and follow them strictly while the examination. If you have any queries related to NID 2019 Admit Card, just leave your message in the message box below. We will reply you soon.